Since Mardi Gras is coming up, I thought I’d find a way to cook a healthier gumbo. There are some shortcuts and some lighter options. But I want to be careful not to destroy the soul of the dish. This is a dish that requires patience and time. So don’t think you can whip it up in 30 minutes. You could work on parts of it over a day or two. And you can shorten some of the time to make gumbo with a pressure cooker. But your shrimp with shell on. Then use those shells to make your own shrimp stock. It will take a bit more time, but you’ll have a better stock. Plus you can control the sodium if you make your own rather than buy it. Next, replace the smoked sausage with a chicken, soy, or turkey version. Or replace it altogether with chicken thighs. Also, use brown rice instead of white rice for an increase in fiber and nutty flavor. You can find visual directions for making a dark roux here. Some lighter recipes recommend canola oil instead of butter or lard for the roux. You’d use almond and rice flours if you were making a paleo version of gumbo. You may need to add in a thickening agent like arrowroot. The starch in the flour is what causes thickening of a sauce. You won’t need it at this stage since you’re just cooking the roux for flavor. File powder and okra should do the trick and both are paleo and low-carb. What would I use? Bacon grease pure and simple. I’m always saving it after I cook up some rashers of bacon. It adds in a lovely smokiness to the roux that works well with the rest of the ingredients. But no matter what, great roux requires great patience. 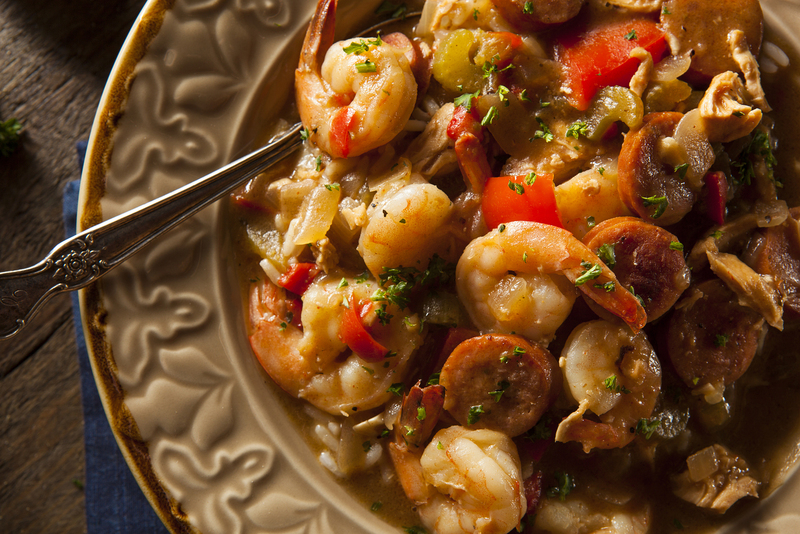 You can find a lighter recipe for gumbo at Cooking Light. A gluten-free gumbo recipe is here at Apron Strings.